His legacy, however, was cemented that day in 1975 when he simply stood in the dugout at old Cleveland Stadium - the first black manager in Major League Baseball. Robinson hit 586 home runs - he was fourth on the career list behind only Hank Aaron, Babe Ruth and Willie Mays when he retired and now ranks 10th. An MVP with Cincinnati and Baltimore, he led the Orioles to their first World Series championship in 1966. Robinson later managed San Francisco, Baltimore and Montreal. He became the first manager of the Washington Nationals after the franchise moved from Montreal for the 2005 season - the Nationals put him in their Ring of Honor. "Frank Robinson's wife, Barbara Ann Cole, once said, "He believes in rules and he respects the game. He reveres the game,'" Bush said in a statement. "When I presented him with the Presidential Medal of Freedom in 2005, I noted that `Baseball fans across America will tell you the feeling is returned. 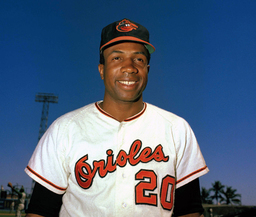 In the game we love, few names will ever command as much respect and esteem as the name of Frank Robinson.'" Starting out in an era when Mays, Aaron, Mickey Mantle and Ted Williams were the big hitters, Robinson more than held his own over 21 seasons - if anything, many who watched Robinson felt he never got his full due as an all-time great. He finished with 1,812 RBIs and hit .294 - he played in the World Series five times, and homered in each of them.